So mama goes off today to Bloomington to see a theatrical re-release of her favorite movie star, Cary Grant, and one of her favorite movies, North by Northwest. The roads got unexpectedly icy – wrecks and ditched cars everywhere – so she has to spend the night overnight in Bloomington! That means Ainsley & I are in the care of Catman and his 2 stoopid cats! A nightmare of Hitchcockian proportions! Now we are In the basement watching his favorite movie star, Liam Neeson, and one of his favorite movies, Taken 2!!! Please call Scottie Rescue – and not the scottie rescue that consists of kindly people with foster scotties and adoptions and good hearts – but the Scottie Rescue that consists of tattoo adorned Scottish Terriers, chomping cigars and wearing kevlar vests while riding in to my rescue on black hawk helicopters and high caliber weaponry! Angus, when the rescue squad arrives, please send them here once you are released from Catman captivity. Also please send helmets. The critters here have had it with construction. Today the destructo guys yook half the kitchen and moved food and water! The nerve! We’ll keep watch for your arrival here in Lincoln Nebraska. Ummmmm. 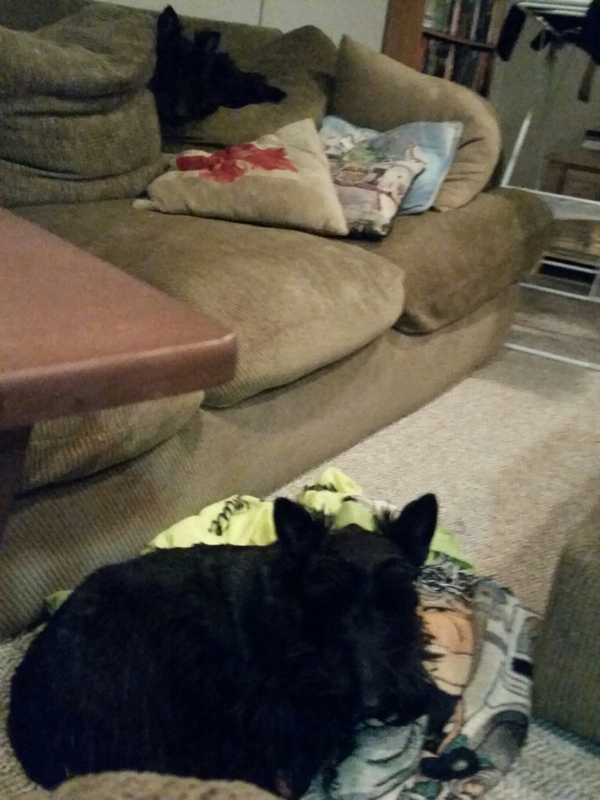 Mom is about eight Scottie generations too late. Horror of horrors Sgt Angus. I will see what I can also organize from here in South Africa……….not that I trust any of them. They don’t have two brain cells among the lot of them. Sending troops, hope we’re not too late! Hope your Mama is safe. Maybe you wud be better off wif the Border Force helping you out……that is if you want a proper job done! Try to hang on…I wiil get Top Cop Bites to fire up the Blogville Police Helicopter, pick up some of his officers and head that way…….thats just not right!